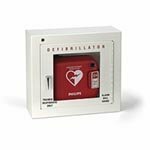 Philips Medical Systems Heartstart AED Wall Cabinet - Basic Surface - Model 989803136531 - Each by Philips at Blood for Sure. Hurry! Limited time offer. Offer valid only while supplies last.